I'm having a bad day, but I don't know why. Superstitions. Almost everyone has a few. And some of the ones we have, we may not realize they are superstitions. I'd be willing to bet you've never thought of where your superstitions came from. Most people don't. But, It's otter to the rescue. I'm going to let you know about the origins of some common superstitions. Opening an Umbrella indoors - This is a superstition that dates back to the very beginning of the modern umbrella. Umbrellas have been around for centuries, but in the 1830's, someone in England decided to make them sturdier. They stared using steel to make the frames. And the steel they used was rigid, strong, and sharp. Houses at the time weren't as large as they generally are these days, so if you opened an umbrella indoors, there was a very good chance you'e injure someone, or break something. It morphed from 'don't open it', to 'it's bad luck to open it'. Today, you can try your luck with opening one inside, but, you do it at your own risk. Saying God Bless You - This one has many possible origins. One has to deal with Pope Gregory I. When he came to power, there was a plague going around. At the time, sneezing was believed to be an early symptom of the plague, so Pope Gregory mandated that people should say a constant stream of prater for the sick. Hence, God Bless You became the de-facto response to a sneeze. Another has to do with the silly belief people used to have that your heart would stop beating when you sneezed. Saying Bless You was believed to encourage God into restarting your heart. My favorite is, some people used to believe that, when you sneezed, you threw your soul out of your body. Someone would immediately say Bless You to keep the devil from taking your soul. 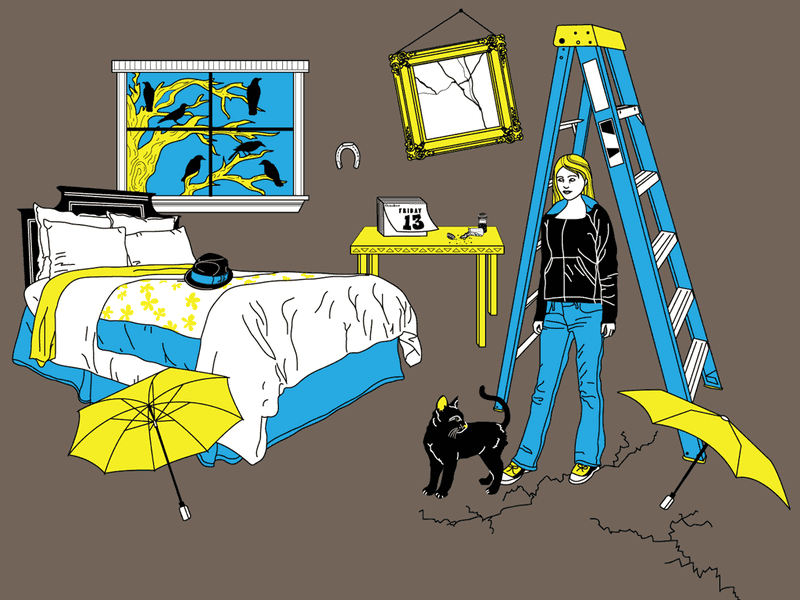 Walking Under a Ladder - This superstition actually has a lot to do with safety. If you don't walk under the ladder, you wont get hit on the head when the idiot on the ladder drops something. But, it actually started some 5,000 years ago with the Egyptians. To them, the ladder leaning against a wall completed a triangle. And to them, a triangle was a sacred symbol of the Gods, and to walk through it was to desecrate it. Early Christians modified it a bit by reasoning that a ladder was placed against the cross Jesus was crucified on. Walking under it is what the Roman executioners did. In the 17th century, in England, the condemned were forced to walk under a ladder on their way to the gallows. This was supposed to be an affront to Christ, guaranteeing they wouldn't gain access to heaven. Breaking a Mirror - Seven years bad luck, huh? Well, that was a later Roman addition. Originally, it was thought to bring on death. Captromancy was a form of divination that was preformed on the ill. A seer would dip a mirrored surface into water and the ill person was to look into it. If the image was distorted, they were going to die. If it was clear, they would live. (and people complain about Obama-care?) Since mirrored surfaces were so expensive, Captromancers started telling people they would die if they broke their mirrors. The Romans decided to soften it a bit by altering it a bit. They believed that health was on a seven year cycle, and if you broke a mirror, you were destined for sever years of bad health. Hanging a Horseshoe - This one comes from the ancient Greeks. They believed iron was a lucky element. Also, horseshoes were wrought into a shape that resembled the Greek symbol for the crescent moon. And, since the crescent moon was considered a sign of fertility, a horse shoe was considered good fortune. Early Christians decided you had to hang the shoe with the open end facing up. This prevented the luck from draining out. Black Cats Crossing Your Path - Black cats. They get a bad rap. I think it's just blatant racism, as people don't hold the same fears of any other cats. In the early years, the ancient Egyptians revered cats. All cats. But, the solid black ones were held in high esteem. 13 - This one comes from Norse mythology. It involves a dinner party the 12 Norse Gods held in Valhalla. Everything was going fine until Loki crashed the party, bringing the number to 13. Well, none of the other Gods liked Loki, so they tried to kick him out. In the ensuing fight, Baldur was killed. And, Baldur was the favorite. Christians justified the superstition by saying Judas was the 13th person at the last supper. And, we all know that turned out, right? Knock on Wood - This is one a lot of people do without realizing it. It has it's origins in the pagan belief of wood spirits. Wood spirits were thought to bring good fortune, so when you wanted something to happen, you'd say it, then knock on a tree to wake up the spirit so they would grant you what you wanted. Rabbits Foot - This is supposed to bring luck. Well, if it wasn't lucky for the rabbi, why do you think it will be lucky for you? Besides, carrying a rabbits foot isn't lucky. Carrying a Hares foot is. but, since most people can't tell the difference between rabbits and hares, and since rabbit feet are easier to get, most people use the rabbit. However, for it to be truly lucky, according to the Celts, the foot must come from the first hare a boy catches. The left hind foot was kept and preserved and then presented to the boy at his coming of age ceremony. Since not every boy could catch a hare, the ones who did were considered exceptional hunters. Or, lucky hunters, depending on who you talked to. There are many other superstitions out there, but nine is my limit. I was going to stop at seven, but I'm not superstitious.